The moon is full this coming Monday night and it looks like we might have clear skies here in the Twin Cities area. One of the things I love to do in my art and in my journaling is celebrate the natural world—changing seasons, dramatic weather, the plants and animals I live among. And the full moon is one of my favorite subjects! For me, that often takes the form of painting in watercolor, but I know not everyone has the time or inclination to learn. So, in this post I’ll describe 4 techniques for celebrating the full moon in your journal that don’t require any artistic experience. Or waxed paper, or pretty much any paper that’s reasonably sturdy, although I think this gives more interesting results when the paper has a slick surface. This works best on a dark background, so begin by painting your page with a dark color, or with india ink or sumi ink, or glue down some dark paper (see “The Lovely Dark” for more information on getting a good dark background). I used black sumi ink to give me a nice dark background. Cut a circle from freezer paper (or whatever paper you are using). If you’re not adept at cutting circles freehand (I’m not! ), use a circular object, a compass or a circle template to mark the circle on your paper first. Freezer paper circle painted with metallic ink. Use a light-colored or metallic or iridescent opaque paint or ink (for example, gouache, acrylic or acrylic ink) to paint the slick surface of the paper, and then press the paper down on the dark page wherever you want your moon. Rub the back lightly and peel the paper off. This will leave a broken, irregular transfer of the circle. Press the inked circle down on your background and then peel it off, leaving an irregular transfer of ink. If not enough paint transferred, you can apply more and transfer again. It’s fairly easy to line up your circle with the first transfer. It can also give an interesting effect to use more than one color, or to transfer a solid color first and an iridescent color on top. If the first transfer isn’t bold enough, I simply repeat the process. You can also repeat with different colors. Another fun variation is to transfer glue and sprinkle it with fine glitter. The irregularity of the transfer makes a more interesting image than just a solid circle of glitter. What could be easier than cutting out a circle and gluing it down? Especially if you have a paper with an interesting texture or metallic finish. If you don’t have a paper you like, you can also paint some paper with metallic ink or paints, or random watercolor washes, and then cut out a section you like. In this example, I used a blue iridescent ink and I also crumpled the paper to add some texture before cutting out my moon circle. I painted some copy paper with metallic blue ink, and then crumpled it for texture before cutting out my circle and gluing it down. The page is a bit of a mess because I had an ink spill, but it will get covered up when I paint my dark background. You can glue your moon on a dark background, or you can paint the background after you glue it down. I glued my light blue moon in place and then painted the background around it in dark blue. While the background paint was still wet, I closed my journal “inkblot” style to get another moon image on the facing page. 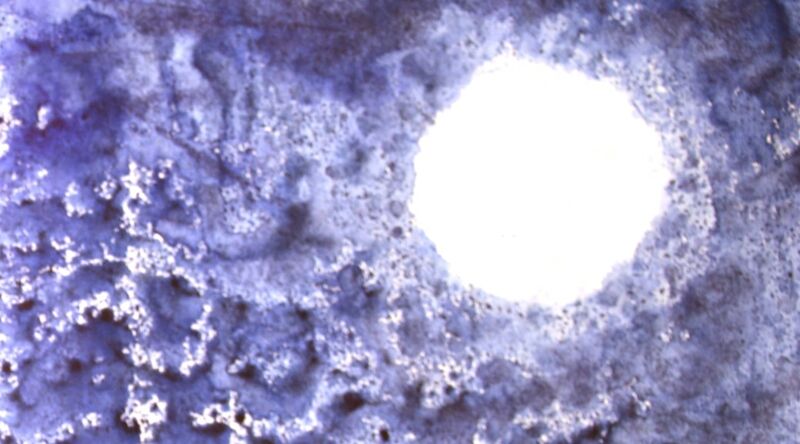 The glued-down metallic moon was dry, so when I closed my journal “inkblot” style, only the background paint transferred to the facing page, giving me another moon image. The metallic paint doesn’t show up well in the photo, but I rather like the two “moods” of the moon on facing pages. After seeing the “inkblot” finish to the last method, you may have realized that you could also create an image of the moon by transferring the background, after cutting out a circle for the moon. The cutout area will have no paint, leaving a white circle, with a broken, irregular background around it. My freezer paper for transferring, this time with a circle cut out to leave white paper where the moon will be. The watery paint beads up on the slick surface of the freezer paper, so I’ll get an irregular transfer. When I press the freezer paper down this time, no paint will transfer where the circle is cut out for the moon. I usually don’t feel the background is dark enough with just one transfer, so I apply more paint to my freezer paper and transfer more to the background several times until I feel it’s dark enough. I also like to lightly mist the background paint while it’s still wet, to get it to bleed and move a bit. Reverse transfer after applying three layers of paint and misting to get the paint to run and soften a bit. Finally, I usually spatter and dribble some paint inside the moon’s circle and then blot most of it back off, to suggest the moon’s cratered face. Of course, we could just draw a circle and paint around it, but I like the dream-like quality of this rough, textural background more than just a white circle with a uniform dark background. A close-up of the reverse transfer method. I misted the wet paint with water to make it run and give the image a dream-like quality. I really love meditative process of building up an image from tiny marks. Stippling is the process of building up an image from tiny dots. You don’t have to use dots, though. You could use other small marks—little lines, small curves, favorite little doodle-shapes—whatever appeals to you. I know this might seem like a ridiculously labor-intensive way to do things, but remember that we don’t have to “finish” a page in one sitting. Rather than being a burden, a page like this becomes someplace I can fall into a quiet, mind-wandering state without any preamble. I start by using a circle template or jar lid to make the initial circle of dots, and then work outward from there. A dotted outline created using a circle template gets me started on this technique. In this example, I decided to suggest a few clouds across the moon. All I really have here is a circle of dots and a few cloud shapes, but this is enough to suggest the full moon. I will most likely come back and add more to this drawing later, but I really don’t have to add anything for it to be effective as a representation of the full moon. It would take many, many hours to “finish” the entire background in a drawing like this, but notice that I don’t have to do any more than this (about 10 minutes worth of stippling) to suggest the full moon. I can come back to this page later to add more, but I don’t feel I have to. I like to always have a page or two like this going for those days when I’ve worked long hours and don’t have one creative thought left in my brain. I don’t have to come up with any “good ideas”. I can just pick up my pen (or pencil, if you prefer) and let myself fall into the quiet zone between waking and dreaming where I can let the creative force flow through me and relax and restore me. Of course, I don’t generally stop with just an image of the moon. As you have seen, I often carry the colors or techniques across to a facing page, where I can write out a favorite poem, or record my full moon thoughts or dreams. So now, even if you can’t draw or paint, you have four easy ways to celebrate the full moon in your journal! Hope for clear skies on Monday, and happy moon-gazing!